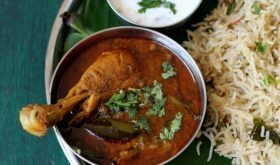 Traditional dishes like Puliyodhara are simple Indian recipes that are straightforward and relished by one and all. Each home cook has his/her own variation of the popular Tamil style Puliyodharai mix which is a combination of spices that include coriander seeds, chana dal, fenugreek seeds and red chilies that are roasted and ground to a fine powder. 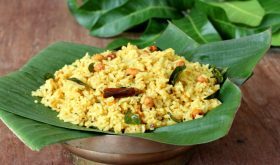 It is this magic concoction along with a blend of tempered spices, tamarind paste, jaggery and roasted peanuts that gives this Tamil style tamarind rice its distinct taste. 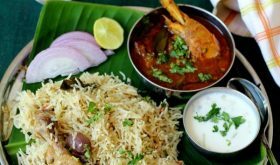 This traditional temple style tamarind rice is also popular in parts of Andhra especially in the Tirupathi, Chitoor and Cuddapah regions. Wash and boil the rice in 8-10 cups water. Cook the rice such that each grain is separate. While the rice is cooking, prepare the puliyogare mix. In a heavy bottomed vessel, dry roast all the ingredients called for 'Puliyogare mix powder'. Dry roast on low to medium flame for 14-15 mts. Do not burn the spices. Cool and grind to a powder. Keep aside. Spread the cooked rice on a wide plate to cool. Once cool, sprinkle salt to taste, a tbsp of oil and few fresh curry leaves over the cooled rice and keep aside. Heat 2 tbsp oil in a cooking vessel, add the mustard seeds and let them splutter. Add the channa dal and urad dal and fry till the dals turn red. Next add red chilis, asafoetida, turmeric powder and curry leaves and fry for a few seconds. Add the tamarind extract and jaggery and cook till the raw smell of tamarind disappears, approx 9-11 mts on low to med flame. Do mix the contents constantly while its cooking. The oil should separate and it will appear a like a thick but flowing paste. Remove from heat. Add three fourth of the cooked tamarind mixtureto the rice and combine well such that its mixed well with the rice. Adjust salt. 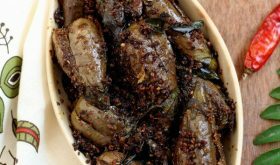 Finally sprinkle two heaped tablespoons of the roasted puliyodharai mix and the roasted peanuts and mix well. Taste the rice at this stage and if you feel that the rice needs to be more tangy, add the remaining one fourth tamarind mixture and mix well. Let it sit for at least an hour for the flavors to set in before serving. 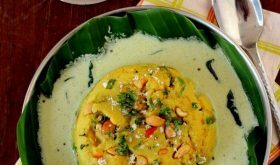 Puliyodharai tastes best after sitting for a couple of hours from the time of preparation. For a spicer flavor, you can add 2 1/2 tbsps of the roasted puliyodharai powder instead of 2 heaped tablespoons. You can reduce dry red chilis in the Puliyodharai mix ingredients. Store the left over Puliyodharai powder in an air tight container for later use. The color of the puliyodharai depends on the color of the tamarind used. Dark tamarind yields a dark colored rice and is recommended. I did not have dark tamarind on hand so I used a lighter shade tamarind. By Sailu Published: October 14, 2013 Puliyodharai recipe is a tasty festival rice dish among Tamil food items. 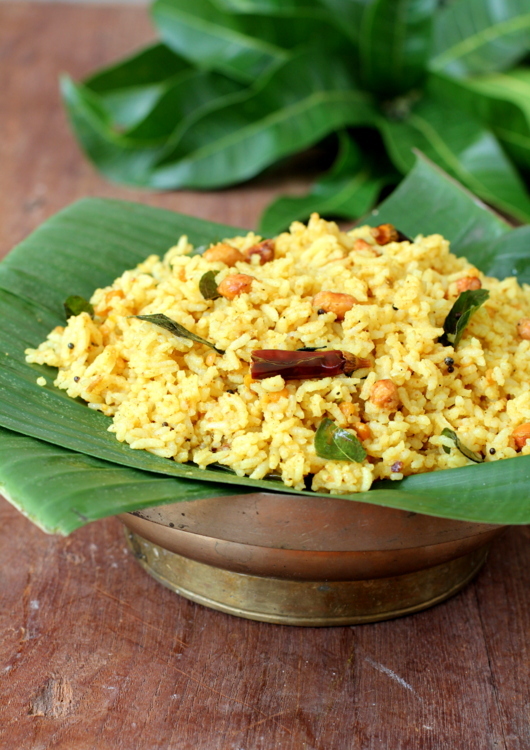 A traditional temple style tamarind rice. 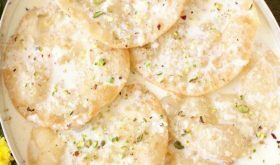 Best authentic simple Indian recipes. I’m a huge fan of your recipes and admire your blog and the presentation of its contents. This is a wonderful recipe and will try making it sometime. I’ve always followed your recipe for Andhra Pulihora and turns out perfect every single time…so thanks for that. I have another request. These days readymade tamarind paste is available which is being commonly used so please can you indicate the equivalent tsp or tbsp or the tamarind paste quantity in your recipes. I normally make my own tamarind paste at home and store it in the fridge so it will be very helpful. Thanks a lot and good luck with everything. Wonderfully done,who can resist to tangy and irresistible tamarind rice,my all time favourite. This tamarind rice turned out to be perfect. Genuine temple food for the soul. Thanks for this simple yet amazing recipe. btw puliyodhare powder has d same ingredients as that of sambar podi right. Hopping in once again to let you know I love the checklist system you’ve created for the ingredients. It really helps me when I’m working from a page. Thanks!